The black Thermomix carry bag is a great accessory for your Thermomix because it helps you take your Thermomix with you where ever you go! The bag has a reinforced base for the Thermomix and compartments for the spatula, butterfly and Varoma. What about your ThermoServer? Well if you follow this simple tip you can store it inside your Varoma. All you need to do is place the ThermoServer with lid on inside the Varoma dish. Then flip the Varoma tray and place on top of the ThermoServer which is sitting inside the dish. The place the Varoma lid on top and sit all of it in the ThermoServer base. Pop it all in the Varoma compartment of the carry bag and you are good to go! 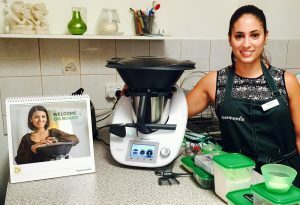 The black Thermomix carry bag is currently available as a purchase offer to all customers who place an order before 31 December 2015. For more information click here.